Michailia Massong, waist-deep in a muddy bog Friday afternoon, fought to hold her best friend's head above water. "Don't you dare give up on us!" she pleaded, as Luna, her 13-year-old American quarter horse, shivered in a swamp a half-mile off Birchwood Loop in Chugiak. Luna had unexpectedly bolted during a routine ride and wound up stuck. The two had been struggling to get out of the bog for two hours. Massong was getting colder by the minute. Luna's gums were turning pale, her breathing was becoming labored. "She was fading on us," Massong said. "I actually thought we were going to lose her." That's because "they" in this case included a team of rescuers who dropped everything to rush to the aid of the stranded animal. Volunteer firefighters came from Chugiak. Officers from Animal Control arrived from Anchorage. An expert in California chimed in over the phone. Neighbors tromped through the swamp with blankets. And a company whose primary job is digging holes for septic tanks instead found itself at the middle of a dramatic equine excavation. "It was a big group effort, not just from people in the state but from thousands of miles away," Massong said Tuesday. "I'm just so grateful people would put a horse before anything else in their lives. It's pretty amazing our community would do that." Massong first met her good-natured golden horse with a white nose when she was just a foal. Luna was born at Massong's grandfather's place and became hers three years later. They've been inseparable ever since. "We do everything together," Massong said. The duo grew up together in Chugiak, where Massong lives a semi-rural lifestyle centered around her two horses and a pony. 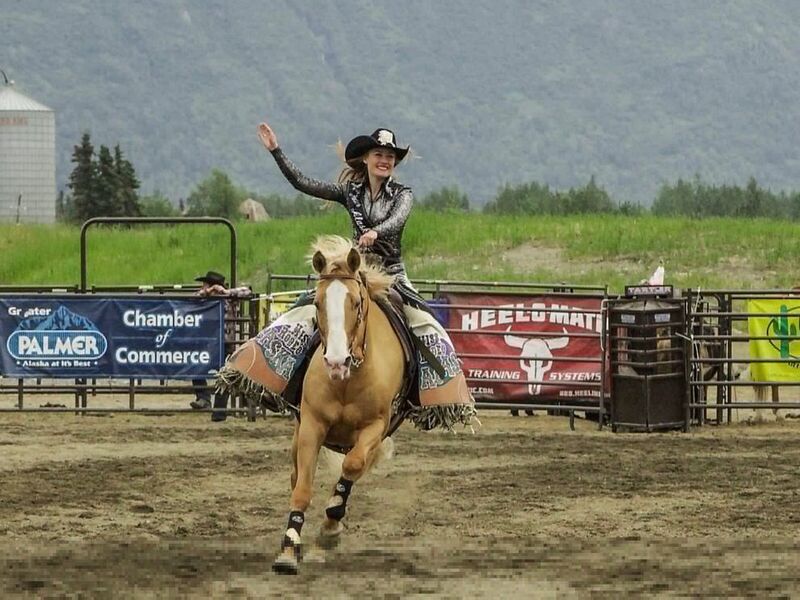 Massong rode Luna to a Miss Rodeo Alaska title in 2017 and the pair work daily giving riding lessons to children. With her gentle nature and sweet disposition, Luna is an ideal teacher. "She is an amazing lesson horse," Massong said. "She loves the kids." When they're not working, Massong rides Luna on the trails near their Chugiak home. Friday Massong and a friend were riding their horses on a trail through the woods when the normally placid Luna suddenly bolted. "She's not a spooky horse," said Massong, who speculated Luna may have stepped on something sharp, hidden in the ground. Massong dismounted and tried to get Luna back on the trail, but the mare again lurched toward the swamp. What looked like a small pool of water turned out to be a deep, weed-filled morass. "The mud kept just sucking her deeper," she said. Massong and her friend started calling anyone they could think of to help. Anchorage Animal Care and Control director Laura Atwood said the department got the call shortly after 2 p.m. and quickly dispatched two officers to the scene. They were able to get there quickly because dispatchers had Massong and her friend send a Google Maps pin with their exact location. Still, for a department used to capturing stray dogs and cats or an occasional loose sheep, a horse rescue was a different beast altogether. "This was definitely unusual," she said. Horse rescues aren't a big part of the Chugiak Volunteer Fire and Rescue Department's mission, either, but Lt. Chris Steeves figured they could do something. When the firefighters and animal control officers arrived, they found Luna hopelessly mired. "It was nasty," Steeves said. Firefighters laid backboards on the ground to gain stable footing, but manpower alone wasn't going to cut it. 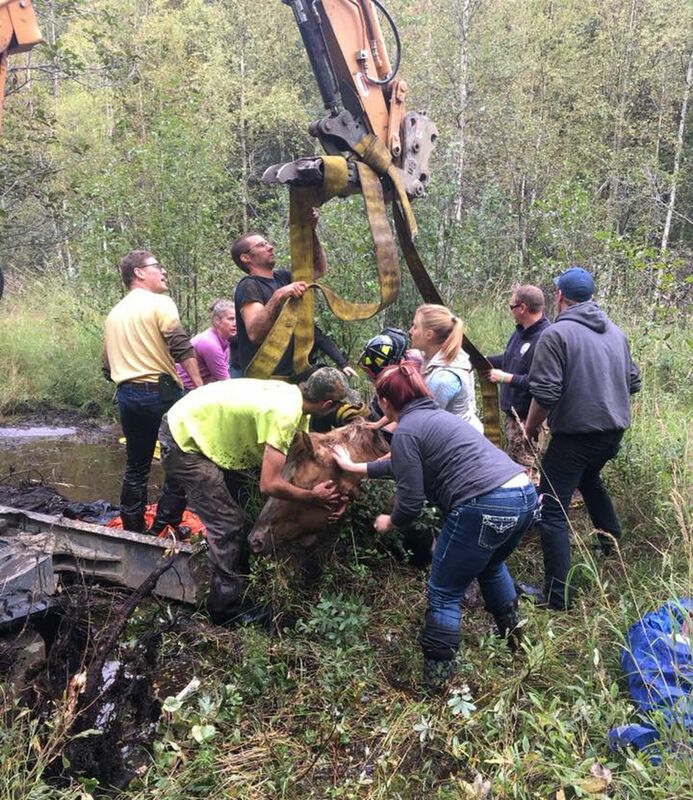 Someone got the idea of using a four-wheeler, but winching Luna out of the mud would be dangerous and likely still wouldn't provide enough force to free her. "It's hard to move a thousand-pound animal when they're not wanting to move," Massong said. 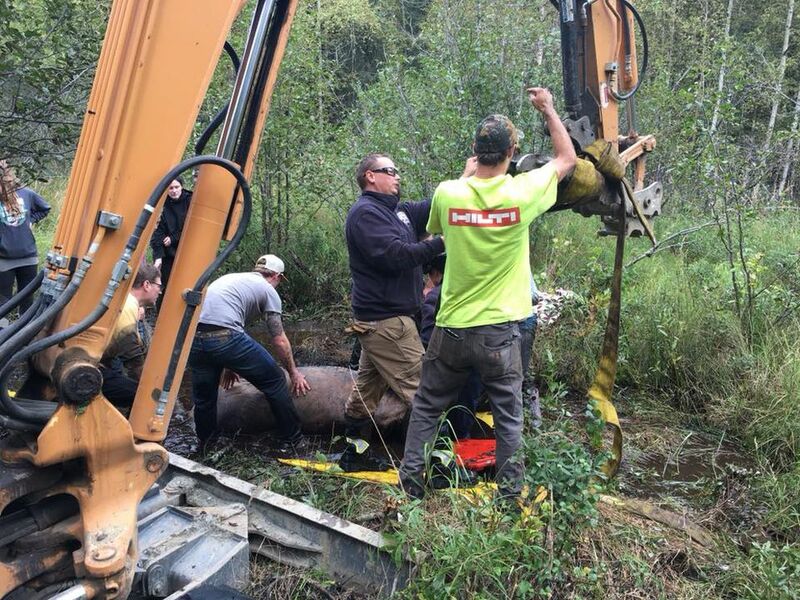 "A horse in a swamp is a first"
Chad Devore, one of the owners of a company that does septic work, was driving from Anchorage to Eagle River when he got a strange phone call about a horse stuck in a swamp. Devore has experience getting cars and trucks out of the mud, "but a horse in a swamp is a first." "I was just thinking of different ways on my way," he said. When he arrived on scene, Devore quickly realized it was going to take more than a bunch of good Samaritans and some backboards. It was time to call in the heavy equipment. Devore called over to a nearby work site, where the company he owns with his dad and three brothers was working on a project. Soon, an excavator rumbled toward the scene. "I can get that thing pretty much anywhere," he said. Devore's dad, Wayne, said it wasn't a hard call for the company to drop what it was doing and volunteer to help. "Why would we not?" he asked. The excavator arrived quickly, but what to do remained a puzzle. Lifting her straight up and out of the muck would require some kind of harness to distribute her weight equally and not injure her further. That's when rescuers got in touch with Massong's boyfriend's stepdad in California — who just happens to have experience with horse rescues. Over the phone, the man guided rescuers through the process of rigging a harness. Although they didn't have much in the way of straps, the firefighters did have access to something similar. So they started cutting. "We rigged up some fire hose, made like a bridle for the horse," Steeves said. As word spread about the horse rescue, neighbors wearing boots and carrying blankets poured in to offer help in any way they could. "The most amazing part was how many people showed up from the community," Steeves said. Once the harness was rigged, Devore used the excavator to slowly and steadily pull Luna straight up and out of the mud. Dazed and covered in mud, Luna laid next to the watery mudhole. As volunteers patted and rubbed her, her spirit slowly returned. Massong checked the horse's legs for injuries, and rescuers cut away the makeshift harness. "She was ready to go," Massong said. One of Luna's front legs had what Massong called "a weird cut," which she thinks may have come from the initial spooking. A veterinarian checked Luna out and proclaimed her a bit bruised up but otherwise healthy. "The cheers when she stood up, it was amazing," Massong said. "She was so happy." Every single person involved in the rescue said they would have been unable to save the horse without the help of the others. "Really is was the Chugiak Fire and Rescue that deserves credit," said Animal Control's Atwood. "The excavator, that was really the key," said Steeves. "It was a community effort," said Septic Solutions owner Wayne Devore. Massong said she thinks everyone deserves equal credit for pitching in to save her beloved Luna. "They're all heroes," she said.